STEM education is a term used to refer collectively to the teaching of the disciplines within its umbrella – science, technology, engineering and mathematics – and also to a cross-disciplinary approach to teaching that increases student interest in STEM related fields and improves students’ problem solving and critical analysis skills. STEM sits within a broader foundational knowledge base and the teaching of STEM is a part, albeit important, of a balanced program of learning. While literacy and numeracy are the core learnings for primary students to explore the richness of the world through creativity and design around science, technology, engineering and mathematics as well as through the arts is exciting and relevant for 21st century students. During 2016 and 2017 we have added resources specifically for STEM which include Bee Bots, hand held microscopes, mBots last year items, with further resources of mBots and Spheros on order. We are well on the way to meet the goal of “Increasing student STEM ability, engagement, participation and aspiration”. Bee Bots programmed using coding. 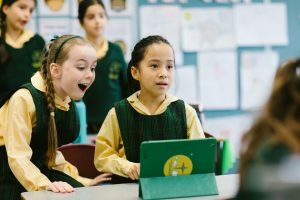 At Ss Peter and Paul’s we enable students to become confident and creative developers of digital technology through the use of information systems and problem solving. Students are encouraged and supported in using a wide range of hardware and software to research, create and present work. 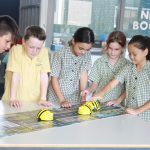 With close links to our STEM program students at Ss Peter and Paul’s also have the opportunities to learn and discover about coding and robotics through the use of BeeBots, MBots and Dash and Dots.